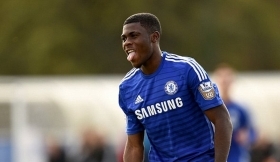 Jeremie Boga is a French attacking midfielder who currently plays for Chelsea under-21s. Boga joined Chelsea as an under 12 player and has since developed into an accomplished midfielder. Although, he has only recently just turned 18, Boga is already beginning to look like a quality player. He has represented France at under-16, under-17 and under 19 levels. Boga predominately plays in the number 10 role in behind the striker, similar to the position Oscar plays for the Chelsea first team, he can also play on the wing if required. Boga is known for his exceptional dribbling ability especially at pace. He often looks to start runs from deep positions and play one-twos, through balls or shoots from the edge of the box. He has a good goal scoring record and shows decent technique when it comes to shooting. Boga may still have to wait a while to get his chance in the first tem as Oscar looks to have secured the number 10 role in the first team and Chelsea have plenty of talent in the wide positions including new signing Juan Cuadrado. However with manager Jose Mourinho giving more chances to young players, with both Isaiah Brown and Ruben Loftus-Cheek making the bench for the game against Man City, Boga may get his opportunity to show what he can do sooner rather than later.